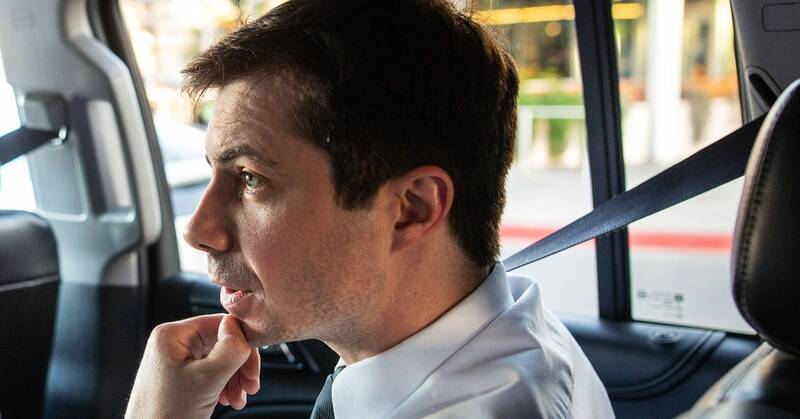 The trick to pronouncing presidential candidate and South Bend, Indiana mayor Pete Buttigieg’s last name is to keep your lips almost totally puckered through all three syllables. At least, that’s the only way I’m able to do it. If I can get my lips halfway between a pout and a whistle, and say it in one quick exhale, I can get it. Bood-eh-jedge, bood-eh-jedge, bood-eh-jedge. I learned this a few days ago from watching video after YouTube video of Buttigieg saying his own name. Until then, whenever I’d read the name Buttigieg—which wasn’t that often, until very recently—I’d read over the weird spelling, make the sound “boojig” in my mind, and move on. I was sure I’d never say the name aloud, and let’s be real, who has time to learn new things anyway. Then, starting in early March, Buttigieg started popping up everywhere. A trickle of weird and unforgettable facts began seeping into the news cycle, each one more idiosyncratic and pure than the last. There was the one about how in high school he had read a book by a Norwegian author that he liked so much that he taught himself Norwegian in order to read the untranslated works of the same author. There was his fluency with the oeuvre of James Joyce. (Running for office is “definitely more like Ulysses than it is like Portrait,” Esquire quoted him as saying. His father was a Joyce scholar.) There was the charming Twitter tale of how he’d given up his first class seat to the woman in coach who was sitting next to his husband, so that the two could spend a little time together. Then there was the heartfelt letter he sent the Muslim community in South Bend after last week’s horrific massacre in New Zealand. Pete Buttigieg is having a moment. This week, CNN declared him the “hottest candidate in the 2020 race.” Which … maybe? Either way, it was time for me to learn his name. Apparently, I wasn’t alone. Type “pronounce” into Google and the first autosuggestion that comes up is “pronounce Buttigieg.” According to Google Trends, searches for that term have shot up 669 percent since the first week of March. Go to YouTube and you’ll find all sorts of videos on how to do it. Type the phrase into Twitter and you’ll find a ton of people who are wondering how to pronounce Buttigieg, have recently learned how to pronounce Buttigieg, are trying to teach other people how to pronounce Buttigieg, are worried they pronounce Buttigieg offensively, or have given up and decided that if he wins the presidency they are going to call him “President Mayor Pete,” a reference to his nickname in South Bend. The real question may be, can someone be president of the United States of America if their name is this hard to pronounce? But as with all guesses about electability, it’s impossible to predict. It could work out in his favor, since the difficulty of his name also makes it memorable. And once you learn how to say it, you feel invested. It’s also worth noting that Barack Obama wasn’t a simple name for people to understand back when he first ran, either. Plus, Buttigieg may have the hardest name to pronounce out of the long list of Democratic candidates, but he’s hardly the only name people are struggling with. What is it about Buttigieg, though, that makes it particularly hard to say? I called up two linguists who study phonetics, pronunciation, and immigrant names to find out. Before I called, I practiced how to say the name right, but when I got Simon Fraser University linguistics professor Murray Munro’s voicemail, I immediately flubbed it: “I’m a reporter from WIRED calling with a question about how to pronounce the name of presidential candidate Pete Booteh-jig,” I said into his voicemail. “Dammit,” I added. When I got Munro on the line he told me not to feel too bad. “The spelling is pretty awkward. It’s pretty weird,” he said. As a result, English speakers don’t really know what to do with it. Unfortunately, none of those words sound anything like how you’re supposed to say the last syllable of Buttigieg. But that does explain why so many people—in this video, for example—try to say the name like “booty-GAYG” (like geisha) or “buddy-GIGE” (like geiger and GEICO). “People in the US see these letters and they want to pronounce them the way they are pronounced when they come together in English,” Munro says. Derwing says that “buddha-judge” is best, because it captures the stresses correctly. Using three words to demonstrate how it’s supposed to sound gives the impression that all three syllables should be emphasized equally. Boot! Edge! Edge! But the middle syllable is more of a throwaway, an unstressed vowel or schwa as it’s called in the International Phonetic Alphabet. But if you really want to say it the way Buttigieg says it, well, that’s harder. First of all, he says it fast. Second, according to Derwing, he says it in a way that’s totally at odds with the rules of English. “Buddha-judge” is probably the best way for English speakers to say Buttigieg’s name. It features Americanized vowels and consonants, but it’s got the stresses in the right place and is generally respectful of pronouncing the word how it’s meant to be. When asked about his name over and over again in interviews, Buttigeig emphasizes how it’s not that weird where he’s from for people to have Eastern European names. Implicit in this answer is the long history of immigration to America, and the melting-pot nature of the country Buttigieg is asking to lead. Names here carry the weight of their histories—some, like my own, were changed at Ellis Island from something harder and more foreign sounding. Luckily, there’s 591 days until election 2020 for me to keep practicing. Next PostNext Apple is ready for its Hollywood closeup, but will consumers bite?